The dynamic radar cruise control system has 2 cruise control modes: constant speed control mode and vehicle-to-vehicle distance control mode. Vehicle-to-vehicle distance control mode is selected by default when the dynamic radar cruise control system is turned on using the cruise control main switch. 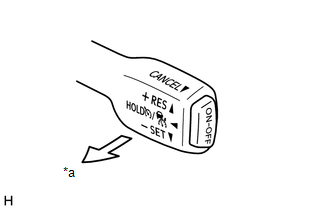 (1) Turn the dynamic radar cruise control system on using the cruise control main switch (ON-OFF button). (2) Check that the cruise control indicator light illuminates in the combination meter assembly. (3) Drive at a speed between approximately 50 km/h (31 mph) and 180 km/h (110 mph). 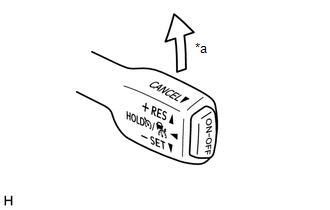 (4) Push the cruise control main switch to -SET. (5) Check that the cruise control indicator remains illuminated, the cruise control SET indicator illuminates in the combination meter assembly and the set speed is displayed on the multi-information display. 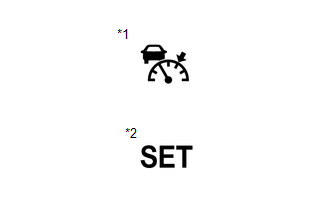 (6) After releasing the switch, check that the vehicle maintains the set speed. (b) Inspect the + (ACCEL) function. (2) Drive at a speed between approximately 50 km/h (31 mph) and 180 km/h (110 mph). (3) Push the cruise control main switch to -SET. Check that vehicle speed increases while the cruise control main switch is pushed to +/RES, and that the vehicle maintains the newly set speed when the switch is released. Check that the vehicle speed increases in increments of approximately 1 km/h (or 1 mph)* or 5 km/h (or 5 mph) while the cruise control main switch is pushed to +/RES and that the vehicle maintains the newly set speed when the switch is released. 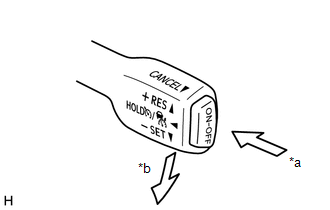 (5) Push the cruise control main switch to +RES and then release it immediately. Check that the vehicle speed increases* (tap-up control). *: Constant speed control mode: increases by approximately 1 km/h or 1 mph; vehicle-to-vehicle distance control mode: increases by approximately 1 km/h or 1 mph. (c) Inspect the - (COAST) function. Check that vehicle speed decreases while the cruise control main switch is pushed to -/SET, and that the vehicle maintains the newly set speed when the switch is released. Check that the vehicle speed decreases in increments of approximately 1 km/h (or 1 mph)* or 5 km/h (or 5 mph) while the cruise control main switch is pushed to -/SET and that the vehicle maintains the newly set speed when the switch is released. 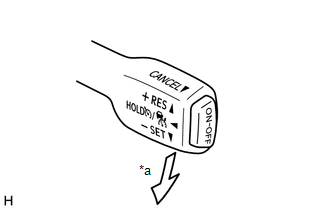 (5) Push the cruise control main switch to -SET, and then release it immediately. Check that the vehicle speed decreases* (tap-down control). *: Constant speed control mode: decreases by approximately 1 km/h or 1 mph; vehicle-to-vehicle distance control mode: decreases by approximately 1 km/h or 1 mph. (4) When any of the following are performed, check that control of vehicle speed by the dynamic radar cruise control system is canceled and that the normal driving mode (no control of vehicle speed by the dynamic radar cruise control system) resumes. Moving the shift lever from D or S to any other position. Selecting the S3, S2 or S1 range with the shift lever in S.
Turning the dynamic radar cruise control system off using the cruise control main switch (ON-OFF button) (The stored vehicle speed in the ECM is not maintained.). (e) Inspect the RES (RESUME) function. (4) Cancel control of vehicle speed by the dynamic radar cruise control system by performing any of the CANCEL functions (other than turning the dynamic radar cruise control system off using the cruise control main switch (ON-OFF button)). (5) Push the cruise control main switch to +RES while driving the vehicle at a speed of more than approximately 40 km/h (25 mph), and check that the vehicle resumes the speed set prior to cancellation and that the cruise control SET indicator illuminates. The stored vehicle speed is retained even if vehicle speed drops below approximately 40 km/h (25 mph). The previously stored vehicle speed can be resumed by pushing the cruise control main switch to +RES when the vehicle speed has returned to approximately 40 km/h (25 mph) or more.